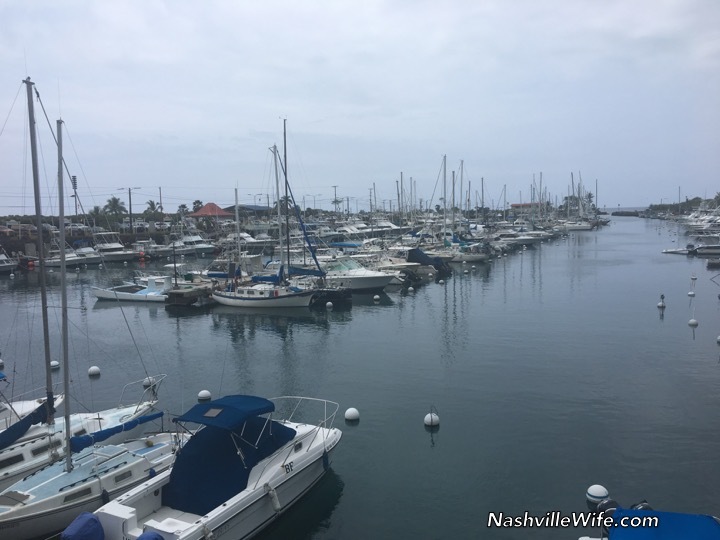 Being the avid fisherman that he is, when Mr. Handsome heard that Kona, Hawaii, is known for fishing, he just had to give it a try. 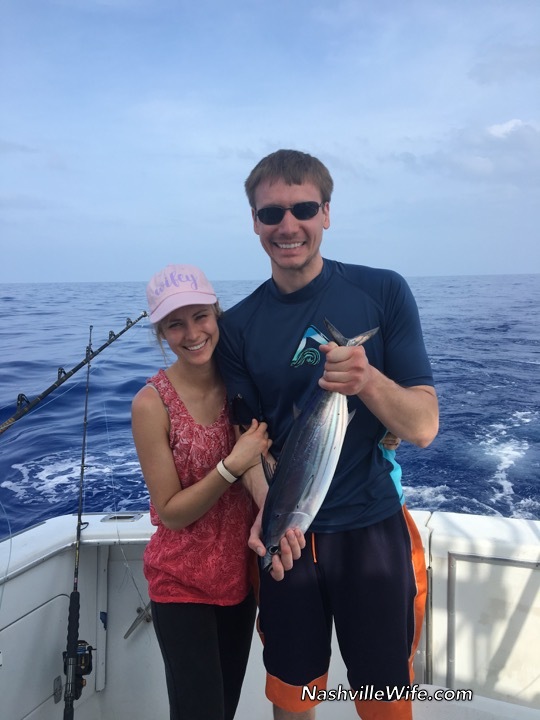 We attempted to go bank fishing, but then we learned that shoreline fish in the Hawaiian Islands can contain a bacteria that causes a type of food poisoning, called ciguatera. Not wanting to ruin our vacation with sickness, we opted to go fishing on a boat with a local. We arrived at the dock shortly before 6am to board the boat. We coasted out past the no-wake zone and were hoping that the loud, lawnmower-like noise coming from the engine would quit once we started going faster. But it didn’t. The sound continued for the entire trip (6 hours). But despite that, we still enjoyed being out on the water. Since the island is one big volcano (or, rather, several) the sharp slope of the volcano continues underwater off the shore. That means that as you leave the shore, the water quickly becomes very deep. 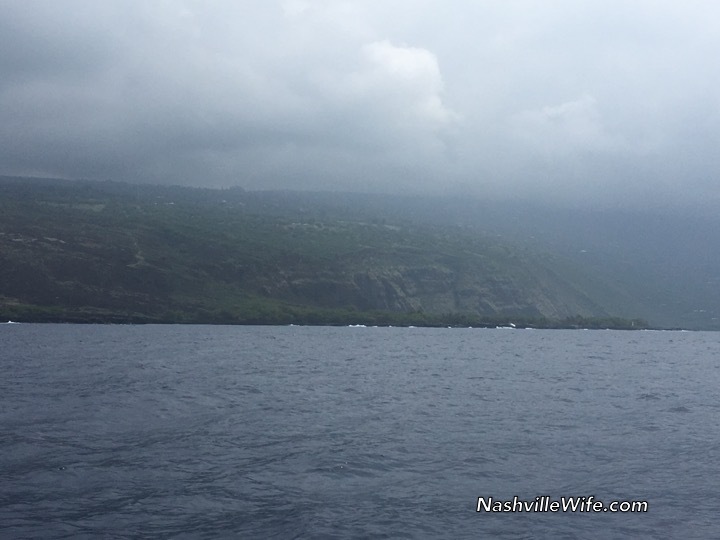 We went about a mile off shore, and the captain happily told us that the bottom of the ocean was more than 3,000 feet below our feet. Yikes! When the sun came up, the views were beautiful. Because the water was so deep, it was a beautiful blue color. 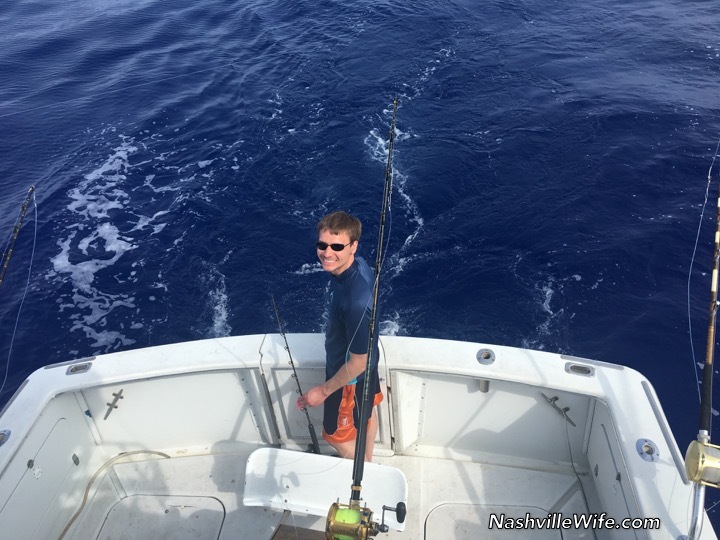 The captain put out several large fishing lines, hoping to catch an 800-pound marlin or a 30-pound ono. 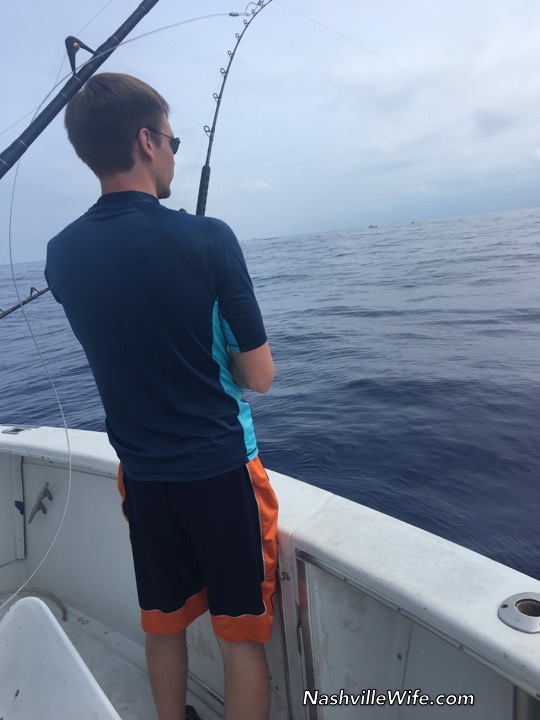 Sadly, we didn’t get anything that big, but we did catch two tuna fish. Mr. Handsome was able to reel his in pretty easily, but after hooking mine, I realized that there was no handle on my fishing rod. The captain had forgotten to put one on. So he grabbed some gloves and reeled the line in by hand, which took about 10 minutes. The tuna were beautiful fish. They had thick, metallic skin and kind of looked like baby sharks. We put them in the cooler and took them back to our condo to grill. The taste was good, but it was strong. We mixed it with mayonnaise and ate it on bread. The fishing trip turned out to be a unique excursion. I felt seasick for most of the time, but it was still a blast. Previous Post: « Fashion ‘Do’ or ‘Don’t’? I love tuna but I'm sure fresh would taste better than the canned variety. I love this! A little unexpected I'd say, but very cool. And you got a meal out of it too, haha! Glad you enjoyed the post. 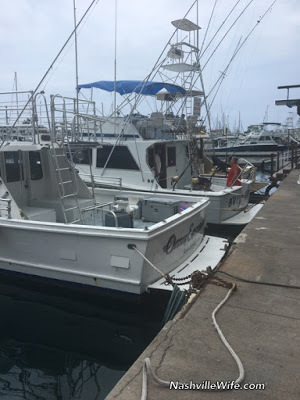 We had never been out on a fishing boat on the ocean ocean, so it was a fun adventure. Ellie that sounds like so much fun! I'm sorry you got seasick though. That's definitely not fun. Thanks, Regina! Thankfully I was still able to enjoy the trip. 🙂 How is the weather in AZ? It seems as though we have skipped spring here in Nashville. Went right from the 60s/70s to 90s. Has your weather turned hot yet? Yep! We have skipped spring too. We have had 80s and 90s. The poor folks in Phoenix are dealing with over 100 degree temps! Were you guys at anywhere near where the current eruptions are going on? We went to the Volcano Park, which is now closed due to threat of eruption. 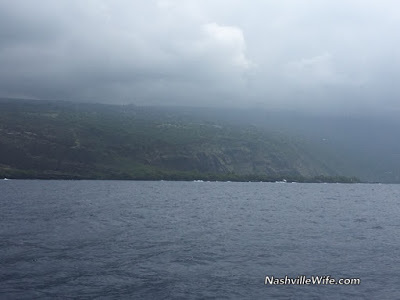 We didn't visit Puna, which is where the evacuations have happened. That's the only area of the island that we didn't have a chance to see. I've been watching the news daily. Praying for those who have been evacuated. I’m so glad you were there when you were, and aren’t there now. What a nightmare some of the locals are dealing with. The power of nature is just staggering. I got seasick on a ferry boat in Hawaii, and I think it’s the worst I’ve ever felt in my life. It was both relentless and all consuming. I’m sorry you had to experience it. Now I use these seasick/motion sickness bands that use acupressure to fight it, I’m amazed how well they work, but it was at least 5 years before I could be talked into getting on another boat. Your blog reminds me why I went vegetarian. I don't enjoy seeing people kill animals like that, not for food and certainly not for entertainment. Doesn't it bother you in the least to know what you're doing? No where in the Bible does it tell us not to kill or eat meat. And in case you are not aware Jesus cooked fish for His disciples. You had to kill your own fish back then because there was no supermarket down the street where you could get alternate sources of protein from all over the world. Isn't it wonderful that we have those choices so readily available to us so we don't have to hook fish and watch them die slow, suffocating deaths? We can understand the pain and suffering these animals go through at our hands. We can realize exactly what we're doing when we kill for sport. I'm sure Jesus approves of humane treatment of animals. St. Francis of Assisi, too. Again it looks like Mr H has master minded the events! I didn’t, but Mr. Handsome did. He thought it was pretty good, although neither of us are sushi fans. Have you tried it? I love poke but I grew up in a culture which has popular dishes comprised of raw fish. I am very aware that raw fish is not everyone’s cup of tea!